How far the Marvel Cinematic Universe has come since Iron Man, the company’s first, extremely successful attempt to turn a lesser-known superhero into a hit film in 2008! Back then, although they did a phenomenal job, one of the primary concerns of the enterprise seemed to be to stress dramatic “legitimacy,” so to speak, balancing superheroics with a mostly naturalistic atmosphere that was both literally and thematically Earth-bound. Iron Man doesn’t feature any intrinsically superpowered characters; instead, it’s simply about a guy in a suit, albeit a very, very rich guy in a very, very technologically advanced suit. Since then, the series gradually began weaving in more fully unreal elements. The Thor films, of course, were a huge step forwards in that regard, although those films were still largely set on Earth and concerned with Earth. Even Asgard is very recognizable as a quasi-Shakespearean environment of classical grandeur that we have seen before in British drama. There are certainly even more overt fantasy elements, such as the Frost Giants and the Dark Elves, and the entire series starts to dip its toes into storytelling on a more cosmic scale, what with the Tesseract and all of the portal-hopping in Thor: The Dark World‘s breathlessly joyful climax. Nothing, however–including the invasion of Earth by the Chitauri in The Avengers–could have fully prepared us for the level of completely-out-there on glorious display in the latest Marvel blockbuster, Guardians of the Galaxy, which manages the neat trick of feeling both like its own distinct entity–a deliberately silly, fun-loving superhero/buddy-heist/prison-break/treasure-hunt adventure film starring a group of ragtag misfits that plays out against the backdrop of an epic space opera universe populated by diverse aliens of all sizes, shapes, and colors imaginable–as well as being connected to the larger Marvel saga. Not unlike Farscape, which seems to have inspired the film on multiple levels from aesthetic to plot, director James Gunn’s invigorating, endlessly imaginative film thrusts an everyday Earthling and us along with him into a dizzyingly enormous landscape composed of countless alien races and planets, all filled with their own histories and backstories that have been playing out long before our protagonist arrived on the scene. While the film zeroes in on a relatively small group of characters, one gets the constant sense of a much larger world extending past the confines of the screen. Gunn’s work reminds me of Alfonso Cuaron’s in Harry Potter and the Prisoner of Azkaban, practically every shot revealing some detail either large or small that hints that there is more to this universe than this one film can capture. As much as each place we visit feels awe-inspiringly fantastical, they also all feel lived-in. A great deal of the joy of the film is the sense that we’re seeing but one story of billions that could be set here. In many ways, Guardians of the Galaxy is the whimsical flip-side to The Avengers. Instead of a group of admittedly unlikely superheroes who join forces under the auspices of a government agency in order to protect Earth, the Guardians all start out as criminals out to make a buck, or more accurately, a lot of them. Peter Quill, code-named “Star Lord” (Chris Pratt, Parks and Recreation), is a thief who captures a certain orb for the gang that abducted him from Earth when he was still a little kid, but then makes off with it in order to keep all the money for himself. Rocket Raccoon (voiced by Bradley Cooper)–yes, a raccoon, albeit a genetically modified, sentient one who can reason, wisecrack, and shoot a gun–and his buddy/muscle, Groot, (voiced by Vin Diesel)–an evolved, ambulatory tree who can only say three words but has emotion and some basic intelligence–initially plan on capturing Quill for the reward from the gang that he screwed over. Gamora (Zoe Saldana) is the former right-hand woman of galactic supervillain, Ronan the Accuser (Lee Pace), sent to steal the orb from Quill in order to bring to Ronon but who has her own plans for it. Drax the Destroyer (Dave Bautista) is a warrior who begins the film in prison for unknown reasons but who is entirely focused on avenging himself upon Ronon, who murdered his family in cold blood. In short, at the start, they’re all in it for themselves. In fact, when the moniker, “Guardians of the Galaxy” is first applied to them, it is out of mockery. It’s only over the course of working together, beginning to bond, and discovering that the stone housed within this orb, if it falls into the wrong hands–namely, Ronan and/or his master, Thanos and/or other right-hand woman, Nebula (Karen Gillan, Doctor Who)–could spell doom for the galaxy that they eventually decide to unite for a nobler purpose, and even when they do, they really only have themselves to rely upon–no organization backing them, no advanced strength, and only the vaguest sketches of a plan to defeat Ronan’s terrifying might and Kree army. And, again, I must reiterate: two of the team members are a talking rodent and a sort-of talking tree, and all but one are outrageously alien in some way, whether it be green or blue skin, strange patterns over the body, or something else. And yet, as completely divorced from Earth as the film gleefully gets, Gunn manages to ground it in numerous ways. Firstly, there is the snarky, sly humor that playfully undercuts any hint of bombast and, in most cases, sentimentality. The scenery-devouring force of evil that is Ronan wholeheartedly luxuriates in the epic space opera of it all and takes it deadly seriously, while Quill and Rocket basically laugh in his face. And secondly, directly tied into that, there is the expertly chosen soundtrack of 1970s pop-rock that plays throughout the film–which comes from an old-school cassette mix tape that Quill plays constantly–often providing deliberate counterpoint to the action and bringing a bit of Earth culture out into the cosmos. Even more importantly than providing humor, however, the soundtrack is indicative of how seemingly effortlessly the film manages to blend postmodern swagger with genuine heart. In the earliest trailers for the film, in which we saw Pratt strutting around as Star Lord and freaking out when the alien guard stole his Walkman with mix tape and headphones, Quill seemed to be the typical rogueish Han Solo type, and his obsession with his silly music more of a pronounced quirk. In the context of the film, however, we learn that it’s actually the only link he has left to his home planet–which he hasn’t seen since he was a child–along with any semblance of normality in his life. Furthermore, it’s one of the only possessions he has left from his mother, who died of cancer when he was very young, only moments before his abduction in the film’s opening scene. He isn’t simply being ultra-goofy-cool in wanting that tape back. It has deep meaning for him. Losing it would be akin to losing his mom all over again. Even his nickname, Star Lord, which might seem a kind of ridiculous handle more befitting a B-sci-fi superhero along the lines of Flash Gordon, has a deeper significance for him that is revealed in one of the final scenes. What might have struck me about Peter Quill more than anything else is that, unlike practically every other orphaned male hero I have ever seen, he spends the entire film affected by his mother, rather than his father’s, death. It’s practically a rule in these sorts of stories, as established in the mythic Hero’s Journey, that a young male hero will be orphaned and grow up longing to know more about his father. Peter, however, grew up without his dad and never gives any indication that he ever thinks about him. His mom, however, is clearly on his mind every day of his life. Compare that to Superman, who lost both of his parents as a child but generally only communicates with the remnant of his dad, Jor-El, in his Fortress of Solitude, or Batman, who similarly lost both but generally only brings up his father. And in the Marvelverse, much of what drives Tony Stark is trying to alternatively impress and rebel against his deceased dad. Quill instead trying to live up to his mom’s dreams for him is an extremely refreshing twist that helps further humanize him, making him more complex than the average charmingly rogueish sci-fi hero. He isn’t too macho or “manly” to miss his mom, even into adulthood, and she shapes who he is as a person, even down to his taste in music. 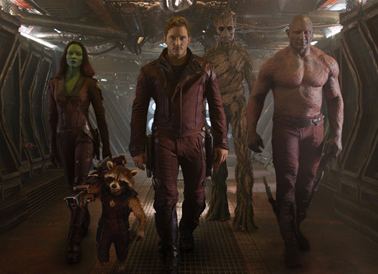 And perhaps the most remarkable thing about Gunn’s screenplay (which he co-wrote with Nicole Perlman) is that he weaves in this sort of development for all of the Guardians, giving each one a character arc and truly affecting moments of (for lack of a better word) humanity, depth, and pathos–yes, even Rocket!–while always keeping the film light on its feet, with more frequent laughs than any other Marvel movie to date–hell, possibly any other superhero film ever. In the climactic battle, all of the film’s many facets are on display: its villain’s genuine menace, its heroes’ hilarious cheekiness, and its preponderance of heart. The sequence runs the full gamut of emotion from fear to laughter to tears. The magnificent Pace is truly scary as Ronan, with more of a visceral scene of bloodthirstiness and hate than any of the previous Marvel baddies, and Pratt’s wiseass reactions to him are terrific but also manage to be surprisingly uplifting, inspiring an unexpected, beautiful display of love between him and his friends. It’s a masterful balancing of tones reminiscent of what Gunn accomplished in his low-budget horror comedy, Slither. It’s really quite something to see an indie director take on a huge blockbuster comic book film that is part of an immense pre-existing series and not lose his voice at all in the process. He also gets fantastic performances from his entire cast. I’m not a huge fan of just listing off each actor one by one, but they all deserve nods, particularly the dreamy Pratt, who, in his first big leading role, effortlessly proves why he deserves to be a huge star, playing Quill with just the right mix of foolhardy/begrudging bravery, comedic swagger, and submerged heart. Saldana is also wonderful as Gamora, conveying a great deal about her character’s tragic background underneath a veneer of unflappable cool. Meanwhile, Cooper makes Rocket hellaciously, acerbically funny, but also lets down the mask at times to reveal the anger and pain that drives him, and Bautista is both hilarious and quietly heartbreaking as the outwardly humorless Drax, who is marked by his overly literal locution, as well as his feelings of pain and loss. And, although he basically can’t say anything other than the phrase, “I am Groot,” Diesel’s Groot steals the entire film. Additionally, the CGI work that brings Rocket and Groot to life is absolutely superb and stunningly lifelike. All of these characters are, by turns fun, funny, weird, and tragic, and that’s what makes them such fantastic inventions. That’s why the laughs are so frequent. Unlike most “silly” sci-fi films, the humor springs from character, and is often the result of them laughing through or over buried pain. They might be the kookiest superhero team ever assembled on film, but they are also each searingly (again, for lack of a better word) human, which makes watching this oddball family form just as satisfying as witnessing the film’s impressive fights, space battles, and gorgeous alien vistas. While it might be too soon to say for certain whether this is my favorite Marvel film, right now, it certainly feels like it. You’re spot on with your comparison to Farscape and your overall review. I loved this movie–heart with too much sentiment, action with meaning, not just for the sake of explosions, a bickering group of individuals who an work together for the greater good, and some great dialog. I’m looking forward to seeing it again. Let me correct that–WITHOUT too much sentiment….